The new mechanistic-empirical pavement design guide (M-EPDG) delivers a state-of-the-art and practice design procedure that eliminates the AASHTO 1993 empirical design procedure deficiencies. Huge advances with respect to traffic inputs, materials characterization and environmental impacts are integrated in its performance prediction methodology. However, achieving accurate and reliable design and performance prediction results using the M-EPDG requires extensive data collection. This presents researchers and practitioners with major challenges as they plan and work towards full adoption of the M-EPDG. Similar to the case of highway agencies in the U.S., it is imperative for highway agencies outside the U.S., such as those in the MENA region, to initiate a comprehensive and customized implementation plan for adoption of the M-EPDG. The main objective of this study is to present a methodology for facilitating the adoption of the new design guide in such countries. 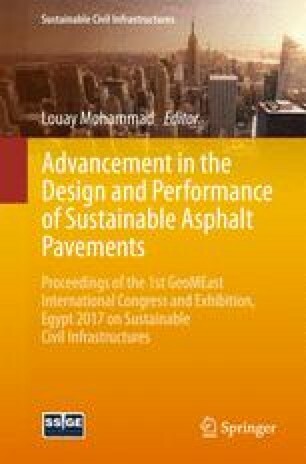 Firstly, the paper presents the current flexible pavement design practices in the countries lacking design input data sufficient for utilizing the M-EPDG. Then, the paper describes the efforts required to gather the necessary input data and presents an approach for utilizing the M-EPDG software. Sensitivity analyses and implementation initiatives are performed for each of the M-EPDG AASHTOWare design input modules, with Lebanon serving as a case study. Performance results are used to determine which of the design parameters require country-specific information, and proposes a plan for acquiring this information and investigates its effectiveness and reliability. Finally, the paper presents recommendations for implementation of the M-EPDG in such countries. The authors appreciate and thank the University Research Board at the American University of Beirut for funding this study. Thanks also go to our colleagues Ms. Zeina Bsaibes, Ms. Yara Hamdar and Mr. Hussein Kassem who helped in completing this study.